HTML Validator in Google Chrome resides as an icon next to the address field, and when it it is autorun/run inline, it displays a green badge with the number 0 if there are no validation errors, or a red badge with a count of the number of validation errors. If you click the HTML Validator icon, it will pop-up a panel at the bottom of the web browser, displaying information about the validation errors. If you want to use a timeout or not for the inline validation. At times, the W3C Validator might be slow to respond. On all operating systems, you can also press Esc to hide the list of validation errors in the pop-up panel. And discussions, requests or bug reports are welcome in the HTML Validator discussion group. 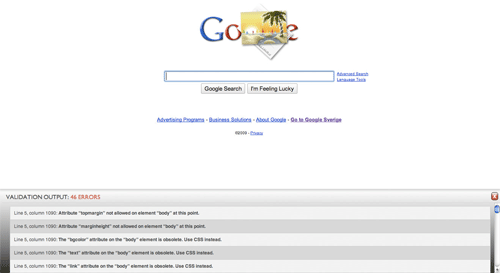 Just go to the Google Chrome Extensions web page and install HTML Validator for Google Chrome. I use it on Snow Leopard every day. Which version are you using, and are there any error messages in the console? I get nothing when I click the “validate local” option. I’m using Ubuntu with latest and greatest Chrome and extension. I believe the W3C validator changed their terms, so local content is not allowed anymore. I noticed a strange problem: when I use the Zebra_Form library, with the CSRF protection enabled your extension makes it impossible to work. More info on my comment. Thanks for the heads-up. Not sure why that can be, and it’s been quite some time since I worked on the extension. Errors found while checking this document as HTML 4.01 Strict! I recently lost my company, major data extraction daily taken place. Emails seem to copied, to include email exchanges to law enforcement. The above is what WC3 markup validator reported. On my yahoo login page, XP and chrome. I don’t know anything about development but trying to verify I have issues. Any help is appreciated. Can you update the extension to use a newer version of jQuery… most of my sites use a CSP header that blocks inline styles, and jQuery 1.4.2 adds one with its support checking. I haven’t really worked on this in a couple of years, but the code is on GitHub, so feel free to use and adapt it. So the version number implies it’s not this validator you talk about. Still, either way, in Chrome you can remove an extension by going to chrome://extensions/ in the URL field, or Window > Extensions in the menu.